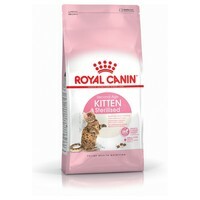 Royal Canin Kitten Sterilised Food has been expertly tailored to meet the specific nutritional requirements of neutered kittens aged between 6 and 12 months old. This advanced formula boasts a unique growth and weight control which helps to reduce the risk of excess weight gain post sterilisation in kittens. The regulated fat content and perfectly balanced nutrients (protein, calcium, phosphorus) in this food ensure a proportionate end to your kitten's development. Dehydrated poultry protein, vegetable fibres, rice, vegetable protein isolate*, maize, maize gluten, animal fats, hydrolysed animal proteins, beet pulp, minerals, soya oil, yeasts, fish oil, psyllium husks and seeds, fructo-oligo-saccharides, hydrolysed yeast (source of manno-oligo-saccharides), marigold extract (source of lutein).